Do you have a favorite bean, or an unusual recommendation that I should seek out? Please tell me!Pesto Pasta With Beans and Greens: Bring a big pot of salted water to a boil. While you’re waiting, wash a big bunch of chard. Chop the leaves into wide ribbons and slice the stems thinly. In a wide pan, saute a sliced onion with the chard stems (set the leaves aside for later) over medium-high heat with a pinch of salt until the onion is golden. Add a clove or two of chopped garlic and stir for another minute. Ladle in a few good scoops of cooked beans along with their cooking liquid (if you’re using canned beans, steal some water from the pasta pot instead). Meanwhile, when the water boils, cook half a pound of your pasta of choice until just shy of al dente, then add the chopped chard leaves for the last minute of cooking. Drain the pasta and greens and add them to the pan of onions and beans. Add more bean broth if needed to moisten the pasta. Taste for salt and season with pepper. Serve topped with a generous dollop of your favorite basil or parsley pesto. Variation: Use kale instead of chard (leave the kale stems out–has anyone tried Tamar Adler’s kale stem pesto yet?) and stir in a cup or two of chunky tomato sauce at the very end to warm it through. Omit the pesto. Nice to see you! 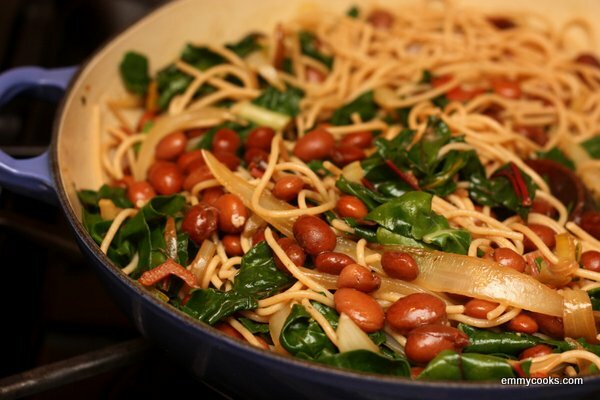 Pasta with beans and greens is one of my all time favorite one-dish dinners. And I definitely know the intoxicating lure of a new legume aisle–an Indian grocery is a dangerous place for me to go, for instance. Thank goodness for mason jars. I make a similar dish but without pesto…will try that next time. That kale stem pesto sounds very interesting – I will have to seek that recipe out! This recipe also looks good! I love pasta with beans and greens. They almost look like baked beans in the photo. Very enticing! Hooray for the bulk bins! I do love beans and now I must get some Ojo de Cabra…they sound marvelous. And as I have a stash of kale stems I will be checking out Tamar Adler’s pesto. Oh, yum! This looks like the perfect dinner! YUM!!! And you know how we feel about beans. I love lentils for their price and the speed of cooking, but larger beans are nice with pasta to give texture. Lovely! Oh my. That looks delicious, Emmy. I have been enjoying the local lentils that have been showing up in the bulk section, but these beans look worth seeking out. Gorgeous. I can’t wait to try them. That looks lovely! I am thinking Savoy cabbage and red adzuki beans maybe? Who sells them? I thought they were only available online. Must get some soon – they’re all I’m reading about in the bean world. Beautiful ideas here, Emmy. I’m the same way! I’m frugal about clothes, my car, everything, except for edible things, kitchen things, and herbs, spices, and condiments that I usually have no idea what I’ll use them for when I buy them. :) This sounds great. We’ve been adding beans to pasta pretty often lately, but mostly just white beans or chickpeas (and then we soak dried pinto beans a few times a month to go with Mexican dinners). My husband loves all kinds of beans, but I never cook them because I don’t care for them at all. I know he’d like this recipe so I will have to make an exception and make it for him. I’m such a good wife :-). Thanks for all the nice things you and your pals have said! Keep up the good work. I hadn’t thought of mixing beans and pasta – what a very good idea!